I feel very fortunate to have inherited quilts and furniture from my family. This picture shows the bed and dresser my grandparents first bought when they married in 1925. 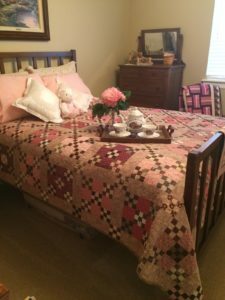 I have designed my entire guest room around it using pink and brown quilts. I just love them! 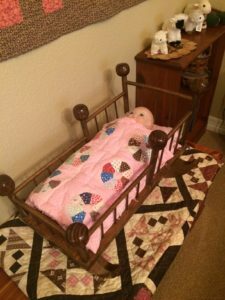 This adorable cradle was built by my dad and my mom made the little pink Dresden Plate quilt. 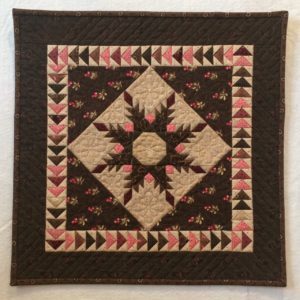 I have it sitting on another pink and brown quilt I made. This room just makes me happy to go into. It brings back family memories and makes me feel the presence of some special people from my past who are no longer with me. 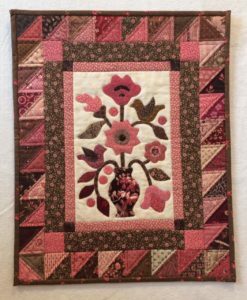 This next little precious quilt (16” x 16”) was made with a kit I purchased at Quilt House in Lincoln Nebraska. 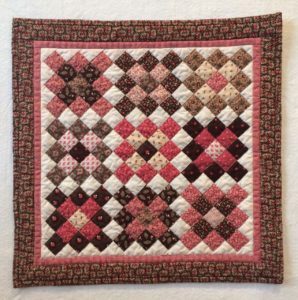 Simple little squares that come together in pink and brown. I’m not even sure why the interactions work so well (from a color study viewpoint) since pink and brown are not even on a standard color wheel but there is just something warm and comforting about them. This next quilt (16.5” x 20.5”) is from a Lori Smith pattern. She makes beautiful patterns that often include applique and I love her work. She makes them look vintage but with just enough charm to fit in the modern world. This last one is probably my favorite. It was also the most difficult with all those tiny “feathers” in the star and lots of flying geese moving around. It is another small (17” x 17”) quilt called “Old Feathered Friends” that I made seven years ago. It helped me build my pink and brown stash as I wanted variety in this piece. It’s always good to have a project that “requires” more fabric in your stash. Quilt shop here I come!